It was not a total lost when Only God Forgives, Nicolas Winding Refn’s much anticipated follow-up to Drive, bombed with the Cannes press corps. At least it should have shown Ryan Gosling how to deal with the Lido drubbing dealt to his directorial debut, Lost River. Maybe Winding Refn’s film is not looking as bad to them, by comparison. Maybe. Nevertheless, his family did not return from six months in Thailand without bringing home one highly watchable film. 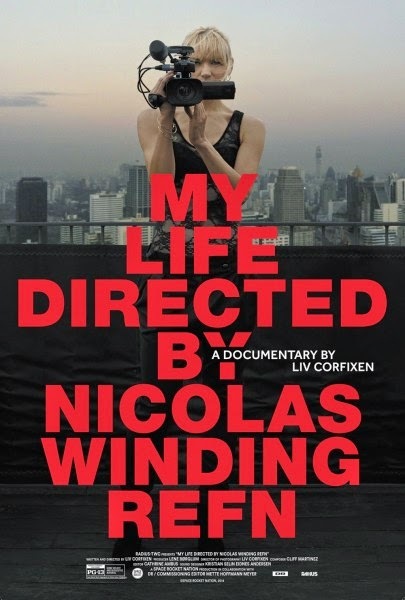 Alas for Winding Refn, that would be his wife Liv Corfixen’s up-close-and-personal behind-the-scenes documentary, My Life Directed by Nicolas Winding Refn (trailer here), which opens this Friday in New York. When watching Corfixen’s film, you immediately realize there was no way OGF was going to work. Winding Refn essentially admits his script makes no sense, which is never a good sign. Yet, his own contradictory impulses imply an even deeper identity crisis for the film. On one hand, he is clearly preoccupied with the pressure to repeat the success of Drive, yet he is perversely determined to produce a something utterly dissimilar. Mission accomplished on that score. Much to her frustration, Winding Refn strictly limited Corfixen’s access to the set. It is evident from their often testy exchanges that she missed a lot of “making of” drama as a result. Still, it is blindingly obvious from the get-go this is a “troubled” production. In some shockingly revealing scenes, she captures all of her husband’s unvarnished self-doubt and self-pity, as OGF irreparably runs off the rails. Winding Refn’s references to compatriot Danish filmmaker Lars von Trier sounds especially telling. They seem like they should be two neurotic peas in a pod, but Winding Refn clearly nurses an inferiority complex. Life should really not be dismissed as a DVD-extra, because it is hard to see anyone packaging it with OGF. After all, the shorter film basically explains why the longer feature attraction is such a chaotic mess. Short is also the right term. The actual movie substance of Life clocks in just under sixty minutes. However, Life has one thing few films can boast: their legendary family friend, director Alejandro Jodorowsky reading tarot and providing marriage counseling. In all honesty, OGF has its moments, but they all come courtesy of the wonderfully fierce Kristin Scott Thomas and stone cold Thai movie star Vithaya Pansringarm, both of whom are seen in Life, planning their climatic scene together. In contrast, Gosling is utterly underwhelming, but to be fair, he comes across like a good sport in Corfixen’s doc, often seen playing with the couple’s young daughters. Perhaps he and Winding Refn should just leave the making of David Lynchian films to David Lynch. Regardless, Life is a brutally honest look at the personal and emotional repercussions of a film that never worked, in any step of its production. It is also frequently very funny, in decidedly uncomfortable ways. Frankly, it is a shame we do not have similarly intimate records of the notorious production processes for films like Heaven’s Gate, but Life will be there as a cautionary example for all future filmmakers battling their expectations and egos. Highly recommended for fans of cult cinema, My Life Directed by Nicolas Winding Refn opens this Friday (2/27) in New York, at the Elinor Bunin Monroe Film Center.